13th March – Videos posted. 13th March – Photos added. 24th February – Results uploaded. 19th February – Schedule uploaded. 19th February – Start list uploaded. 1st January – Poster uploaded. 1st January – Entry form uploaded. 1st January – Event page created. Discover yourselves when SAA holds the first age group race walking competition in February 2013. 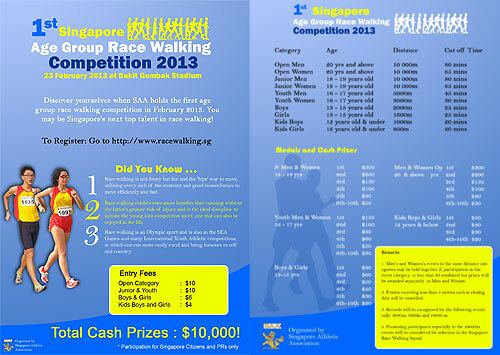 You may be Singapore’s next top talent in race walking! Total Cash Prizes : $10,000! Note: There will be no refund of entry fees for any withdrawal / no-show after the closing date. Registration is closed as of 16 February 2013.